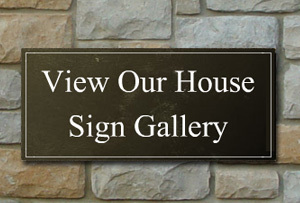 If you wish to add a border to your house sign the cost is shown in the second column. Prices include delivery to UK mainland addresses, wall fixings and VAT. We accept payment by most major credit cards. You can also pay by Cheque as detailed in the frequently asked questions section. For any other sizes, shapes or designs please call for a quote.